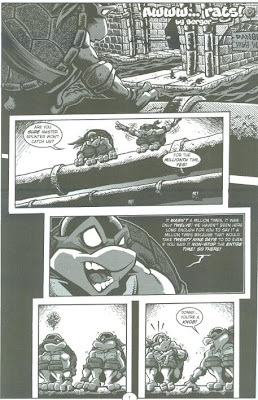 Balancing on a pipe over a sewer tunnel with an old warning sign above it, “Danger: High Water”, a young Donatello asks Raphael if they’ll get in trouble with Splinter for being there. Raph, annoyed, says he told Don a million times that they’ll be fine. Don gets upset and tells him he’s only said so twelve times, as it would take him twenty-nine days to say it a million times, even if he did it nonstop. Raph tells Donny he’s a knob. A wave of fast-moving water comes gushing out of the tunnel and Raph tells Donny they’re going to play stuntman like on TV. The two jump into the rapids and crash around in the waves, having a good time. Unfortunately, Splinter catches them. Plucking them out of the water and carrying them off, he tells Raph that he won’t be watching anymore TV for a while (though Raph insists it was all Donny’s idea). Splinter reminds them that he’s told them a million times to stay away from the dangerous tunnel. Donny says that Splinter has only told them seventy-four times, as in order to tell them a million times, it would take twenty-nine days straight. 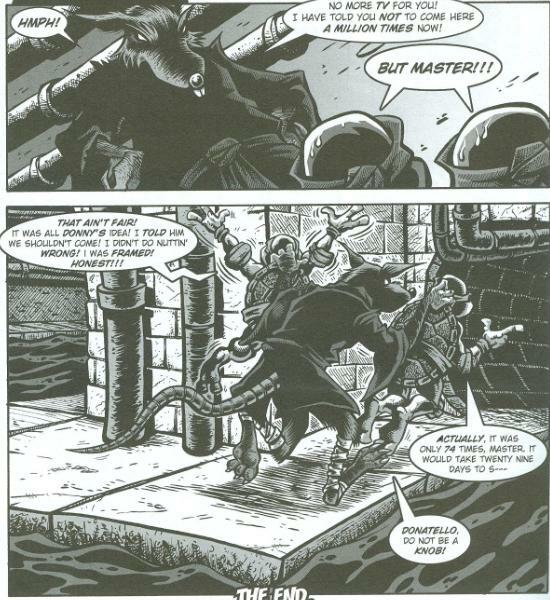 Splinter tells Donatello not to be a knob. Cute little three-page story, though not much else to discuss about it. I like how menacing Berger’s Splinter looks in this story; I actually can’t recall very many stories he’s done with Splinter in them. 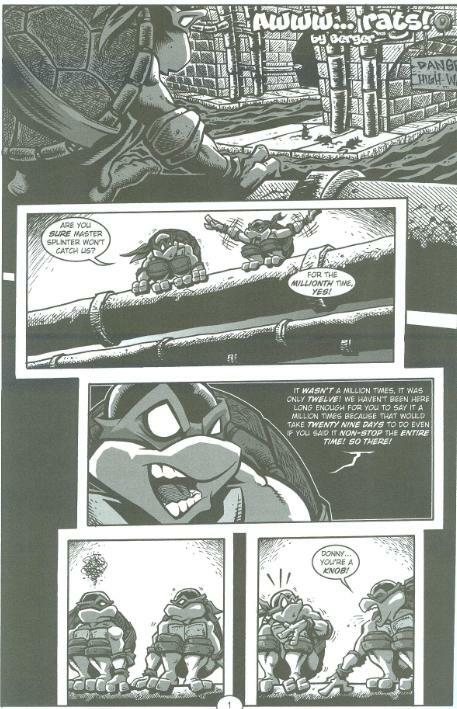 It’s been a while since I’ve read any of Berger’s old TMNT daily comic strips, but I recall Splinter looking much friendlier in that series. 1) I hope that was rain water they were playing in. 2) Where does all the light in the sewer tunnels come from?